An emotional day, as we began our final field trip of the course. If I think back to my last days of school, university, various jobs, it has always seemed a bit surreal. It’s very difficult to internalise that this is in fact the end. But, to borrow a cliché, all good things must come to an end, and as our field trips have certainly been very good things, it is only natural that they should also come to a conclusion. Today’s tour was entitled Jerusalem: a conclusion. It basically featured two main sites: Nabi Samuel and the Tower of David – both of which offer fantastic 360° viewpoints; both of which enable us to run through all the periods of history from the biblical period until the modern day, thereby acting as a great way to sum up the course and help refresh the brain a little ahead of our final exams. In addition were a few other sites which for various reasons we had not managed to fit in to our previous trips to Jerusalem, and so we found the time today. 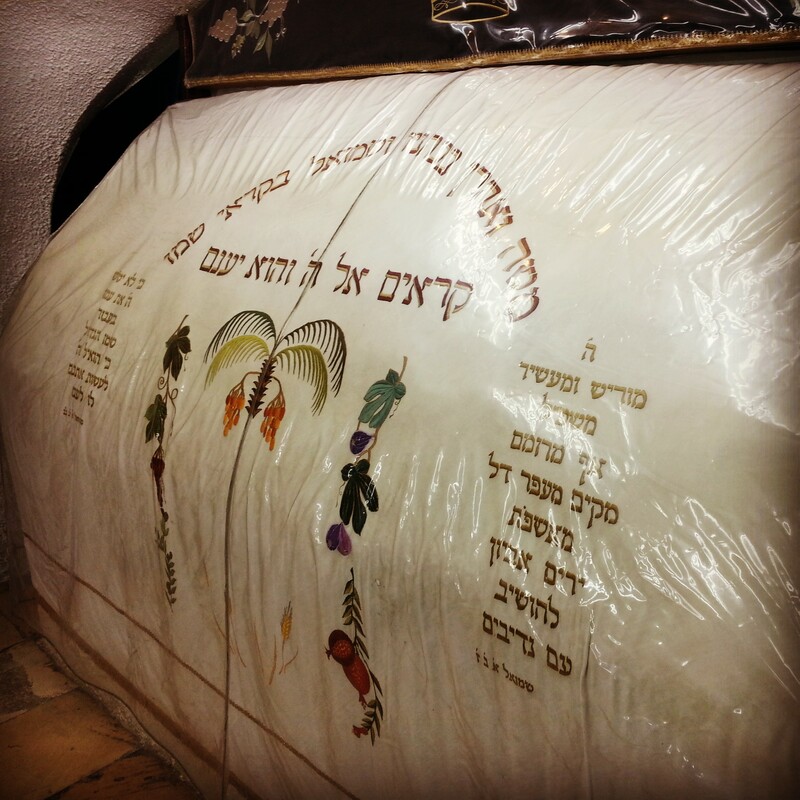 Our day began at Nabi Samuel, believed to be the tomb of the prophet Samuel, my namesake. As with many religious sites in Israel it is a little confusing – the same structure contains a site the Jews consider to be the tomb and another that the Muslims believe is the tomb. There is some historical basis for this being the site of Samuel’s internment; excavations have uncovered a Jewish settlement here in the biblical period (albeit some time after Samuel would have been around). However, the majority of the remains visible today are from the Crusader fortress built here in the middle ages that was later converted into a mosque by the Mamluks. As well as the history, the site offers a spectacular panorama of the Judean Mountains, south to Jerusalem and north to Ramallah (and on a clear day, all the way into Gush Dan). Having metaphorically feasted on this most delightful of sites, it was time for a more literal feast with a valedictory breakfast. I have mentioned previously that our class has a va’ad (committee) responsible for social events; we had all received commands with regard what consumables to bring, and in true Jewish style, there was far too much food. Getting back on the bus afterwards required quite some effort. I am pleased to say that all of my finely boiled eggs were consumed, as of all the purveyors of boiled eggs (and there were several of us) I was the only one who had taken the trouble to shell them in advance. Which was jolly nice of me, I suppose. 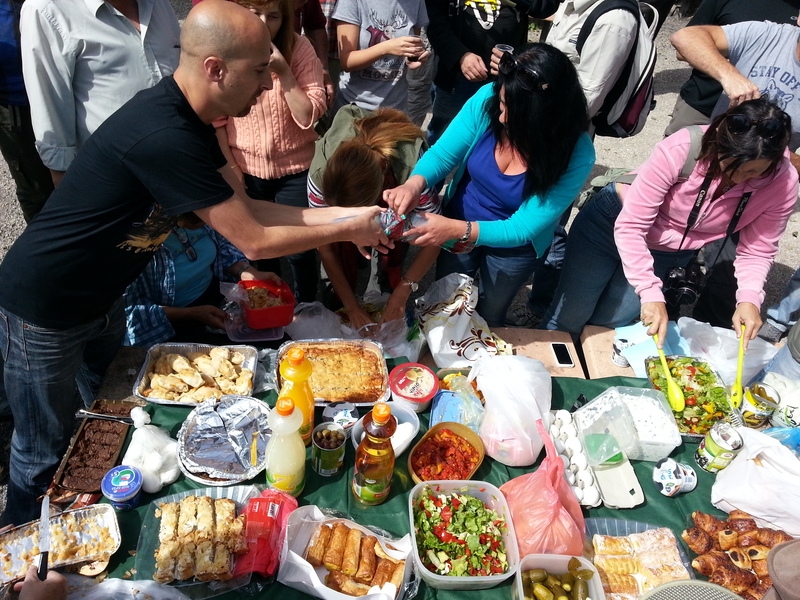 Our bellies over-filled, we travelled to the Jaffa Gate to the Old City. 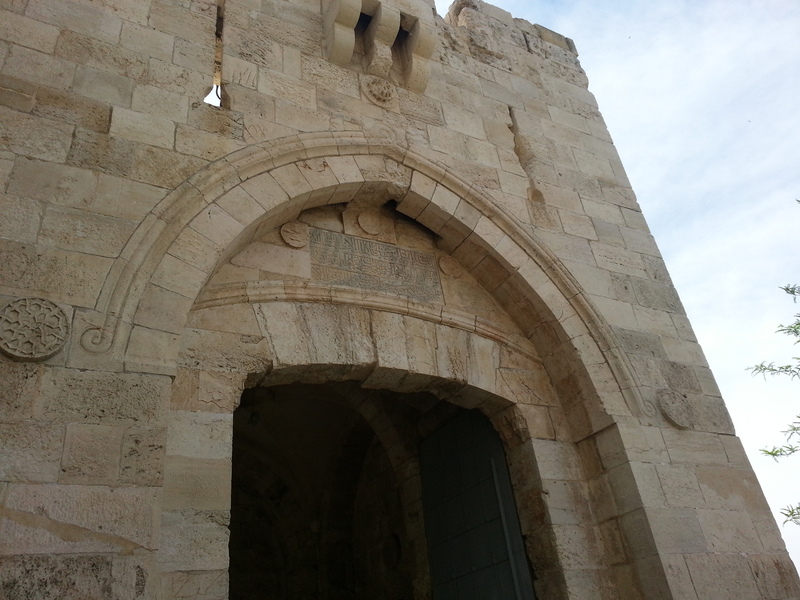 We must have passed through this gate umpteen times during the course, but now we took the time to hear about the construction of the current walls in the 16th century, their possible purpose and indeed the construction of the Jaffa Gate. Entering, and pointing out various sites of import en route, we arrived at our next destination, the Tower of David. 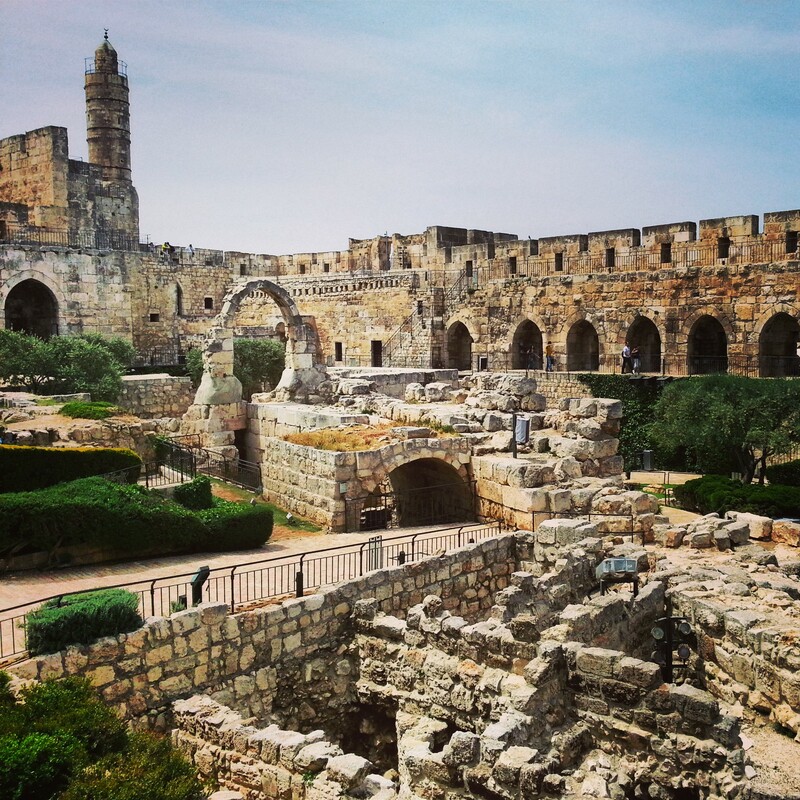 The Tower of David is an archaeological tour de force with significant remains dating to the Hasmonean fortification of the site over 2000 years ago. After an examination of the walls (one of the main subjects of the course has been the location of the walls of Jerusalem throughout different periods of history), we ascended to a fabulous panorama over the Old City, and then turned to enjoy a great view over modern Jerusalem. The Tower of David also contains a museum that takes the visitor briefly through the key events of the city’s history. It provided a useful summary for us at this stage in the course and is nicely done although I fear it is looking a little bit dated compared with some of Israel’s more modern museums. An interesting experience awaited us at our next stop: the Christ Church. Located opposite the Tower of David, it is the oldest Protestant church in the Middle East. These days it is part of the Church’s Ministry among Jewish people (CMJ for short) who are keen to proselytise among Jews – this can create some tension. One of the staff took us around, introducing himself as a Jew, but one who had accepted Jesus as messiah. 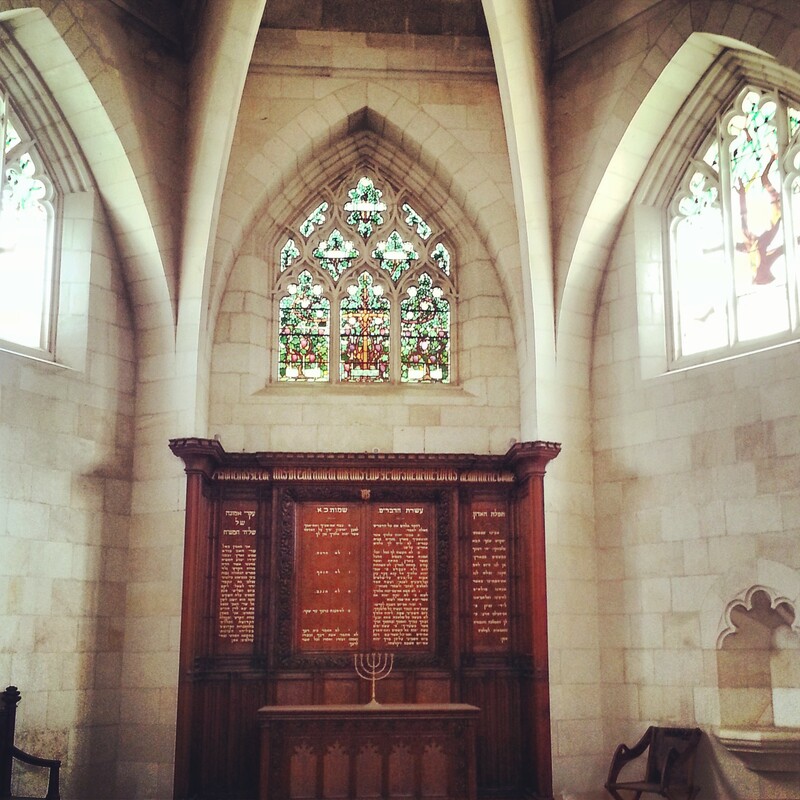 On entering the church, a menorah stood atop the altar in place of the usual cross. It is certainly an unusual group. Of special interest was the museum which contains some fantastic models by the famed Conrad Schick (avid readers will recall I played him when visiting his home, Beit Tavor, several months ago). 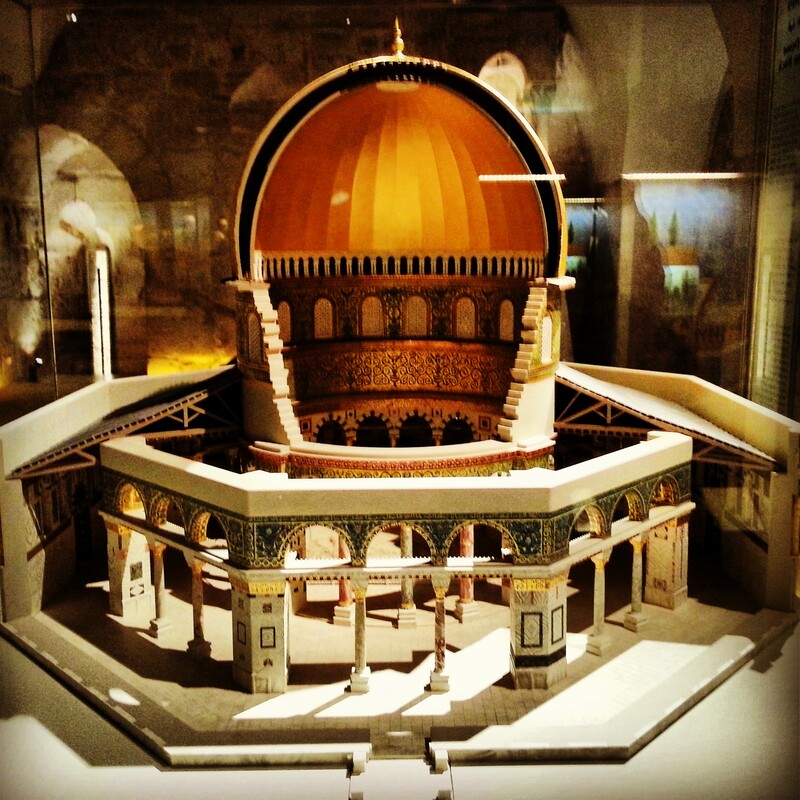 He is one of the few people to have been allowed to excavate on the Temple Mount, which makes his scale model so interesting. 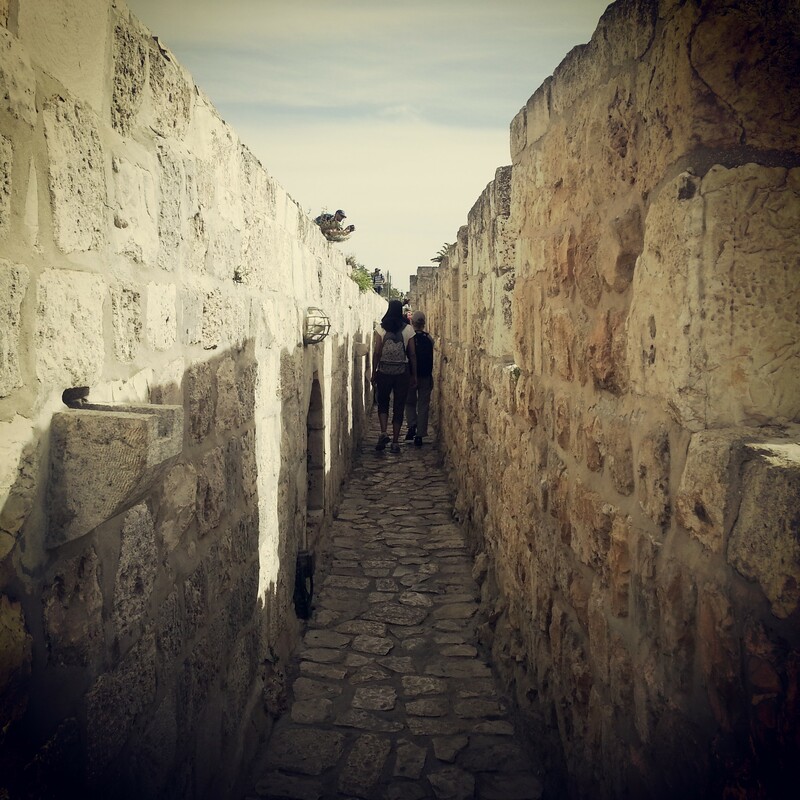 It was time to bid farewell to the Old City of Jerusalem, and we did so by taking a relaxed walk along the ramparts, accompanied by various songs in praise of Jerusalem. It is possible to walk nearly all the way around the walls (albeit this requires occasional ascents and descents) but we just walked a reasonably short distance to the Zion Gate. Still, the walk offers a different and interesting perspective into what goes on behind the closed doors of the buildings of the Old City, and was a nice way to pay our final respects to a place which we shall no doubt be visiting on many an occasion in the future, in a professional context. 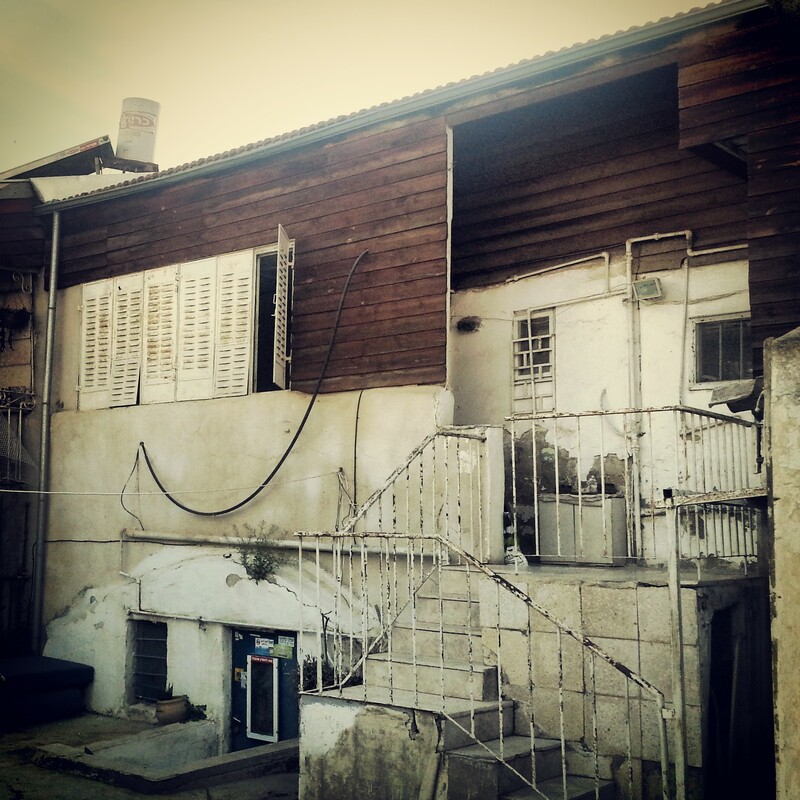 Our final journey was to the Nachlaot neighbourhood, a charming part of the city which is very popular with the young and hip. Our guide entertained us with colourful stories of the area’s past as we wandered its narrow streets and enjoyed its charming old buildings. We concluded our day by crossing Aggripas street into the Machane Yehuda market; a few culinary treats later and we were on our way home. On the journey back, I reflected on the transformation I have gone through over the past year and a half. I remembered the first field trip, when I returned home exhilarated but exhausted; bewildered by the vast amount of information that I had to begin to absorb. It is remarkable to feel how far I have come, how much I have developed my understanding of this country in all its aspects: geography, geology, nature, history, culture, religion. From the stunning landscapes of the Upper Galilee, the Golan and the Negev to the incredible ancient ruins dating back over 3500 years, to the inspiring stories of the builders of the modern state, it is been an extraordinary journey. We have covered the country from north to south, east to west; we have driven its roads, hiked its trails and crawled through its tunnels. The amazing thing is that we still have not seen all that this tiny piece of land has to offer; something to which to aspire for the future, I suppose. I hope you have enjoyed joining me on this virtual journey. I now go into the crucial period of exams and then hopefully will be awarded my license sooner rather than later. I shall continue to update this blog with details of my adventures and travels around the country, so don’t worry, you have not heard the last of me yet!